Gentleman Auction House's Virtual Tag-A-Long: This Sat, 8/15 - GAH w/Jon Hardy & The Public @ The Chapel! 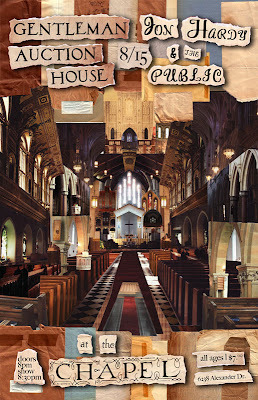 This Sat, 8/15 - GAH w/Jon Hardy & The Public @ The Chapel! Tomorrow Night @ The Chapel! Start your night early with us - all guests at THE CHAPEL receive two drinks maximum (beer, wine or soda) for free! Show ends early too (10:30), with plenty of time left to party with the bands at Par Lounge next to the Hi-Pointe theater. Showgoers will enjoy happy hour pricing on drinks! THE CHAPEL is an all ages, not-for-profit, non-smoking, music venue that exists to serve St. Louis musicians by providing an excellent physical space and professional volunteer services. All guests at THE CHAPEL receive two drinks maximum (beer, wine or soda) for free -- donated by supporters of THE CHAPEL.